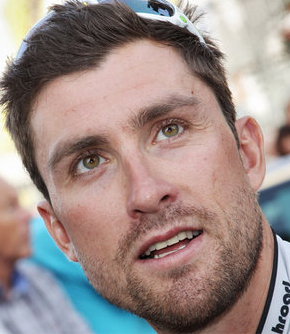 VeloNews has commandeered Bernhard Eisel to report from the Tour de France. Over the years I have enjoyed watching Neal Rogers of VeloNews cover the news at the Tour, becoming increasingly more and more exhausted every stage, not knowing where he was or what stage it was, or where he was going, but always knowing the riders and being respectful, prepared, and professional. 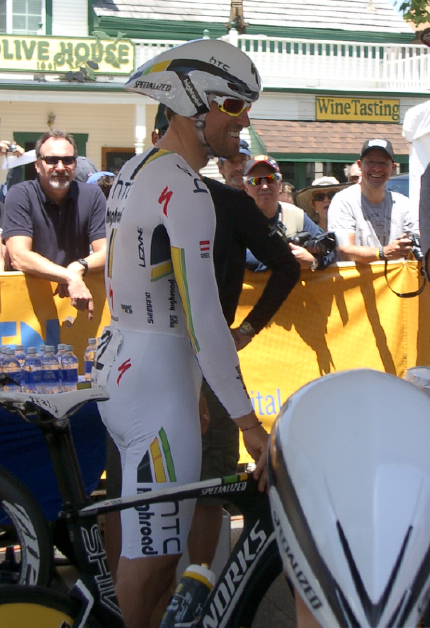 This year Neal Rogers will not be at the 2011 Tour de France as a journalist. I am smiling a big smile however because Bernie Eisel will be. Not only will he be riding and offering team support to his HTC Highroad teammates at the tour in his continuing roll as Mark Cavendish's leadout man, but now we get to hear this gorgeous man speak on a new daily video diary at VeloNews (search for the videos titled "Breakfast with Bernie"). Bernhard Eisel is a good choice. 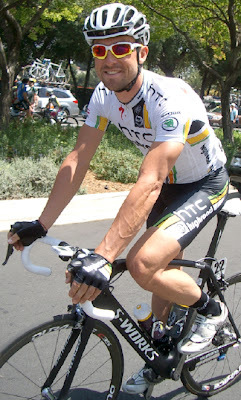 He is an experienced professional cyclist but is also quite funny and likes to have fun. He is 30-years old, from Voitsberg, Austria. He considered himself a sprinter, until Mark Cavendish (a very close friend) showed up on the scene. Now he proudly considers himself a lead-out man and leader of men. Bernhard Eisel is class. He speaks 5 languages including excellent English in an Austrian accent with a twinge of Australian (he learned from his teammates). What I noticed most about Bernhard Eisel at the Tour of California is that the other riders genuinely like being around him, no matter what team they are on or what country they are from. There are a few riders that the peloton simply enjoys and Bernhard Eisel is one of them. His nickname is Bernie. Following Wouter Weylandt's tragic death at the Giro d'Italia this year when so many riders spoke up to say what an admirable and funny human being he was, it made me reflect over the fact that there is much more behind the grimaced face of a pro cyclist than a race report can convey. I am very happy to see more of the human side of the riders. If we can't see them suffer in the way that we as amateurs would appear to suffer on a climb, we might as well see them having fun as we do off the bike! Neal, who will be your subject for the daily tour diary this year? Hi Ed, I won't be covering the Tour this year (I'm sitting this one out, enjoying summer in Colorado.) 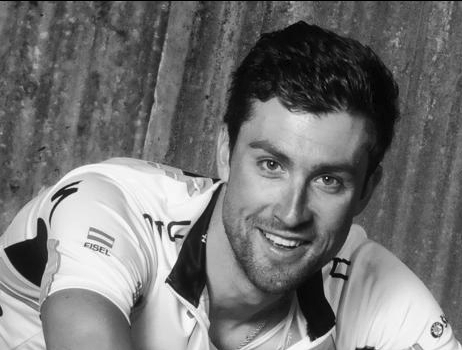 But we have lined up a daily video diary with HTC-Highroad's Bernhard Eisel, a very witty and classy rider and one of Mark Cavendish's main lead-out men. Quote: “something strange happens in every bike race you do”. ~ Bernhard Eisel. We are going to have some exciting unpredictable fun in France in 2011! View the HTC Highroad team rider profile page for Bernhard Eisel's career highlights and stats. Bernhard Eisel also has a website: http://www.eisel.com/ (coming soon). Bernhard Eisel - did you know that Bernie rode the 2008 Tour de France with 2 fractured vertebrae. He won his first race at age 11 and was motivated to get into cycling by watching his older brother compete. Bernie likes to read, a lot, he also likes to talk, a lot, while riding a bike and chats constantly over the miles. In 2000 he broke his nose in 2 places and lost three teeth and was motivated to return to cycling by watching the Tour de France on TV. Since then he has competed in the Tour de France 8 times. 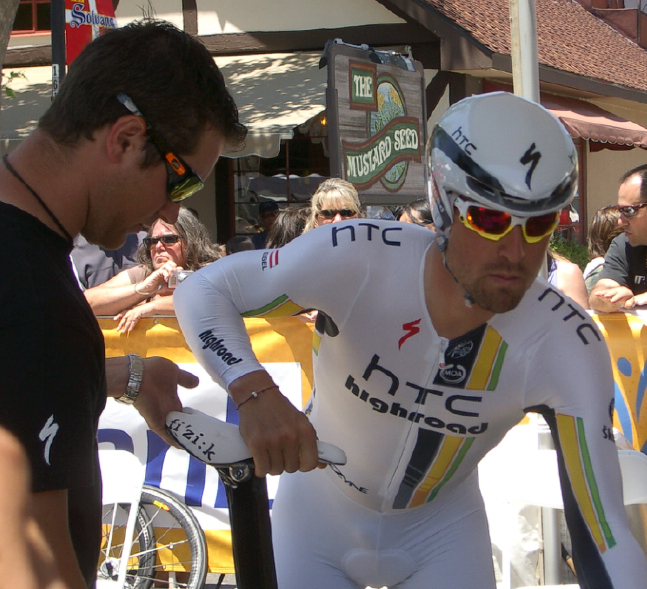 Post post update 07/03/11: Did Bernie Eisel finish after he crashed in Stage 2 of the 2011 TDF? Bernie is still in the race! Sunday, July 3, 2011 Bernie solos the Team Time Trial Wearing dossard #173 Bernhard Eisel is now in 173rd place in the GC today. 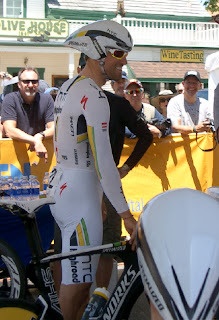 Post post update, 07/18/11: I have tuned in everyday to watch Breakfast with Bernie during the TDF, I was hoping VeloNews would loosen up and ask more interesting questions of Bernie, and they finally did at the very end for a satisfied fan. Bernie seems to be a a funny intelligent well rounded man, I would have liked to have heard a little less questioning of what will happen (always an unknown anyway) in the race, and a little more lifestyle stuff like his view on the new religious movement in Austria called Pastafarian, or if he liked the Basque sausages as well as the ones he can get in Austria. 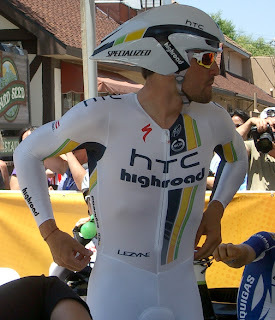 Or perhaps the worst thing he ever pulled out of a feed bag, or who has the most annoying pre-race rituals. But these answers will have to wait - until next year.